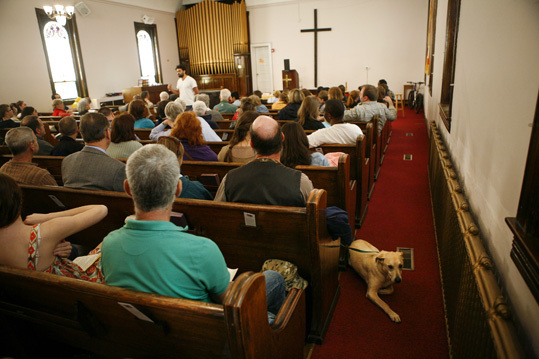 Creatures great and small are welcome at Haywood Street Congregation's Wednesday worship service. On that day, as on every other Wednesday, the created community at Haywood Street was a rare and stunning mix -- many homeless and some “housed,” Christians and Jews, pastors and parishioners from other churches, black and white, young and old, families and single people, gay and straight, sober and … (for a few) maybe not so much. And Penny wasn’t the only dog. 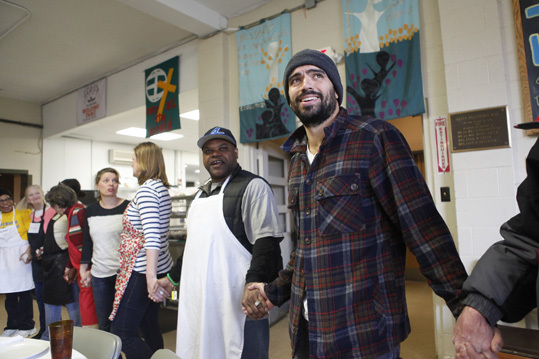 Known as a church of “holy chaos,” the Haywood Street Congregation is a United Methodist mission church that was launched in 2009 as a place of welcome and ministry for people who are homeless or otherwise living on the margins in downtown Asheville. 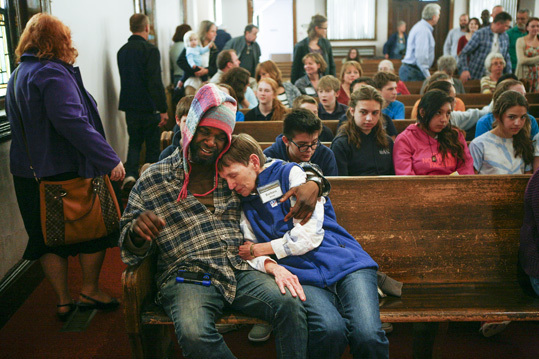 In addition to the Wednesday worship service, the church offers a long list of programs, including recovery groups, Bible studies, AA meetings, a clothing closet, a community garden and an eight-bed respite-care unit for homeless people who need a place to recuperate after a hospital stay. Haywood Street's respite care unit is home for Rob Sampson as he recovers from treatment for lung cancer. All this is bursting forth in a building that was formerly home to Haywood Street United Methodist Church, a long-struggling congregation that was closed in 2006 and merged into Central UMC a few miles away. At a time when mainline churches and their leaders are searching for new ways to do and be church, Haywood Street is an example of entrepreneurial and innovative ministry happening within a large denomination. 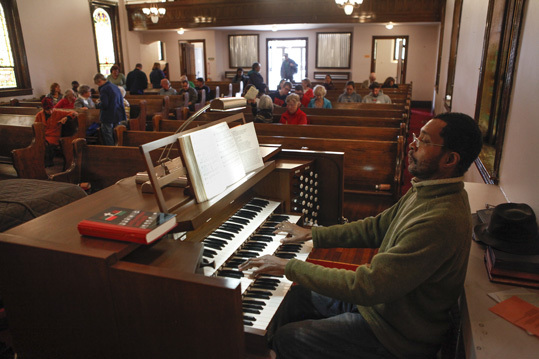 Organist Edward Clarence Smith launches into a hymn as worshippers gather. And different it is. Haywood Street Congregation is a church plant that doesn’t look like a typical church plant. It’s a church that doesn’t worship on Sundays. It’s a hybrid of sorts -- part church, part nonprofit, with a full-time executive director who spends much of her time on grant writing and other fundraising efforts. And it is a church that is supported financially and otherwise by other churches and organizations throughout Asheville and, increasingly, all of western North Carolina. The one thing that was clear to Boggs and Goodpaster was Combs’ passion for ministry to people on the margins. Combs, 37, came to ministry following a short and unsatisfying career in industrial design. After receiving his M.Div. at Emory University’s Candler School of Theology, he did chaplaincy training at Grady Memorial Hospital in Atlanta, a large public hospital that serves a significant proportion of the city’s low-income residents. Working in the hospital and on Atlanta’s streets, he ministered to people who were homeless, people who were mentally ill, people who were dying from AIDS, people who were struggling with addictions. Who is the Jesus that you know? How does that shape your understanding of ministry? Combs had found his calling. Returning to his home conference in western North Carolina in 2007, he asked to be assigned to do similar work, but few if any such jobs existed in the mostly rural region. “The cabinet responded, as most would, ‘We don’t have anything like that,’” Combs said. 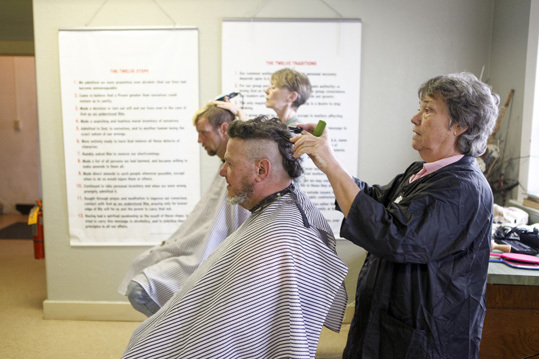 Warren "Cherokee" Formann gets ready for worship with a free haircut from volunteer Sharon LeDuc. Instead, Combs was sent to rural Haywood County, just outside Waynesville, to serve as pastor to two small, declining congregations. It was a poor fit for a pastor called to urban ministry. Before long, Combs felt isolated and became depressed. He considered leaving ministry. “It was so contrary to everything I was called to,” he said. In 2008, Combs began calling UMC conference offices in large cities across the country looking for a position in urban ministry, and was about to accept an appointment in Pittsburgh when he heard from Boggs, a pastor whom he had known for years. Formerly the pastor at Combs’ home church in Charlotte, Boggs had just been appointed as the district superintendent in Asheville, and had heard from his counterpart in Waynesville about a young pastor who wanted to do urban ministry. When he realized that the young pastor was Combs, he gave him a call. “When I told [Boggs] that I was planning to leave for Pittsburgh, he told me to hold on,” Combs said. Combs and Boggs weren’t the only pastors in Asheville interested in ministry to people on the margins. The Rev. Rob Blackburn was as well. Blackburn’s church, Central United Methodist, had merged with the declining Haywood Street UMC two years earlier. Central had kept the Haywood building open as a place for ministry, renting space to various nonprofits. New life is bursting forth in the former home of Haywood Street UMC, which closed in 2006 and merged with Central UMC. 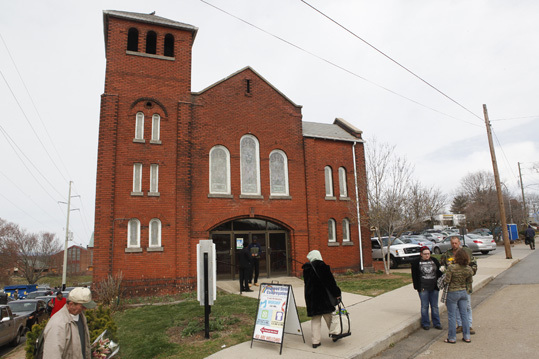 But Combs knew that Blackburn wanted to do more, and the two pastors began talking about the possibility of using Haywood’s building as a place for Combs to launch his ministry. In a pivotal meeting, they had lunch with Bishop Goodpaster and talked about Combs’ vision for ministry in Asheville. Goodpaster was excited, and agreed to support the proposal. “The excitement was around Brian’s passion for ministry and the opportunity to be in mission,” Goodpaster said. How comfortable are you with uncertainity, with not knowing the end result beforehand? They all felt deeply called and committed to Combs’ vision but had no idea how they would make it a reality. When Boggs pointed out all the uncertainties and issues, from infrastructure to finances, Goodpaster had a ready response. So they forged ahead, not sure exactly where they were going. Combs welcomes a mom and her baby to the Welcome Table meal. After Goodpaster appointed Combs to this yet-to-be-determined ministry, Combs spent six months on the streets, meeting people in homeless shelters and under bridges, talking and listening to them, asking them what they needed. What he heard would form much of what Haywood Street Congregation is today. The Wednesday worship service, for example, came out of those conversations. 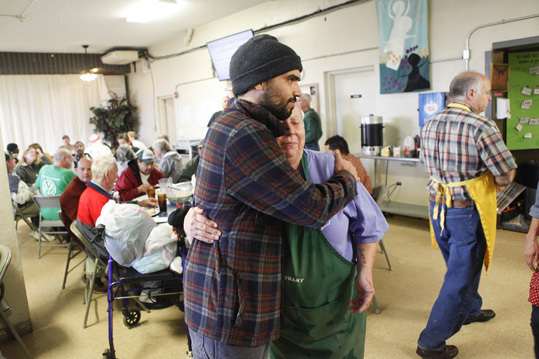 Plenty of churches have services and meals on Sundays, people on the streets told Combs. But by midweek, things can go off the rails for people who are homeless or struggling from addiction. Blackburn and the congregation at Central UMC also signed on, agreeing to let Combs use the Haywood building. “Rob said, ‘Here’s the key to the building; it’s yours,’” Combs said. Though Central still owns the building, Haywood Street pays for the utilities and repairs. Combs also spent much of that first year -- and every year since -- talking to churches, businesses and social service agencies throughout Asheville, sharing his vision for a ministry to the homeless. After the first year, the district and the conference provided a $30,000 start-up grant from the United Methodist Asheville District Trustees and a $280,000 declining-balance grant from the Western North Carolina Conference Office of Congregational Development. By the very nature of Haywood Street’s ministry, Combs and the others knew that financial sustainability would always be an issue. Unlike other churches, they could not look to members for donations but instead would always have to seek resources elsewhere. From the beginning, the church has essentially operated like a faith-based nonprofit, serving the community, building relationships and scrambling for funds. Combs hugs volunteer Trudy Gordon at the Welcome Table meal. 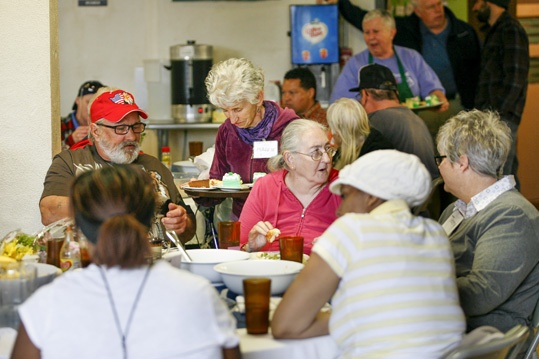 The church serves about 400 free meals every Wednesday. 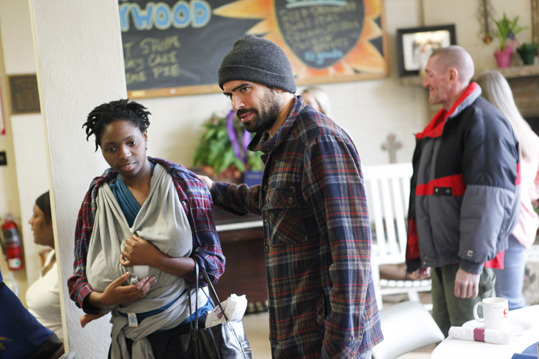 About three dozen congregations -- from United Methodist to Pentecostal, Catholic and Jewish -- play important roles at Haywood Street, providing financial, in-kind and volunteer support. The church also works with local housing agencies, health care providers, social service organizations, civic clubs, schools, restaurants, businesses and grocery stores. All the relationship building has paid off. Since 2010, Kirby said, the church has been able to cover a growing percentage of the annual budget through its own fundraising efforts -- even as its ministries have expanded. Overall, the budget grew from $155,000 to $589,000 from 2010 to 2014, when the respite care area opened. Although the church continues to receive funds from the conference and district, those monies account for a much smaller percentage of the budget than just a few years ago. Last year, almost 50 percent of the church budget came from donations from individuals, 15 percent from other churches, and 10 percent from businesses and special events. Conference and district funds, which accounted for 68 percent of the budget in 2010, now cover only about 15 percent. In effect, the church has been able to reduce its financial dependence on the conference and district, at least in relative terms, Kirby said. “What’s significant is that we’ve been able to do more without having to go back to the conference and ask for more money,” Kirby said. All the numbers and dollars represent real ministries that happen every day at Haywood Street. But never, perhaps, are they more visible than on Wednesdays. One of the day's three Welcome Table seatings begins with grace, led by Combs. When the church held its first midweek service in November 2009, a handful of people attended. Now, 75 to 100 gather for worship, and 400 are served at the free meal. The day starts with Story Circle, led by Barbara Bates Smith, a congregant and nationally recognized storyteller. Anyone who comes can share any story they like. The first of three Welcome Table seatings starts at 10:30 a.m., but beforehand, people can get a haircut or a manicure or shop at the Clothing Closet. The meals aren’t served soup-kitchen style. Instead, volunteers bring food to the tables, where it’s passed around family style. The food is excellent cuisine donated by some of Asheville’s best restaurants. No one has to attend the service to get a meal; everyone is free to eat and leave. Even so, many stick around. The Welcome Table meal is served family style, with excellent food donated by some of Asheville's best restaurants. What would worship be like for you to be "blown away by the Spirit?" On that day in early March, Combs’ “conversational homily” was about John 2:13-22, Jesus and the moneylenders in the temple. Combs talked about anger and asked the congregation whether anger is a Christian emotion. As people raised their hands, Combs called on them by name. Many said they had struggled with anger. Eventually, the conversation shifted to the subject of righteous indignation, the kind of anger felt at the experience of injustice. “Maybe that kind of anger is the kind that moves us to take positive action for change,” Combs said. After the homily, a man in the front row became agitated, stood up and threw what he mistakenly thought was a Bible (actually a binder containing the bulletin) on the floor. “We don’t need what’s in here,” the man said. He talked briefly about how hard it had been to watch his father slip away from Alzheimer’s disease, and after rambling a bit, he stopped. “We just need to love each other,” he said. Combs touched his shoulder and leaned in supportively. The man calmed down, but Combs stayed near. 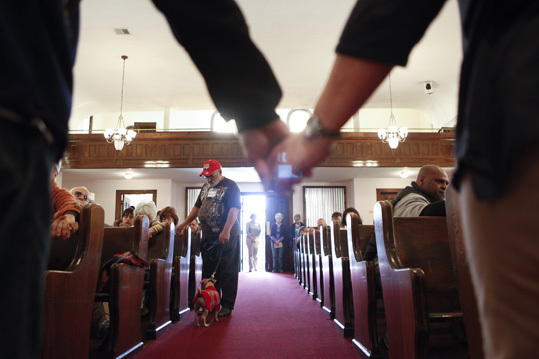 A man and his dog join worshippers at Haywood Street Congregation. People aren’t required to be sober in order to attend the services, which can lead to exchanges that many traditional congregants aren’t used to. All the better, Combs said. How does your church challenge people and make them uncomfortable? What's the right balance between welcome and challenge? As the word about Haywood Street has spread, the congregation has become a teaching model for other churches. Pastors, youth groups and church councils from across the region visit frequently, wanting to learn how they too can start such a ministry. Combs is sometimes surprised by all the interest. Who is the Jesus that you know? How does the answer to that question shape your understanding of ministry? Is your church or organization willing to “make it up” as it goes along? How comfortable is it with not knowing the result beforehand? Does that help or hurt ministry? What other congregations can your church partner with? What nonprofits and businesses? How would you make an inventory of potential partners? When have you felt “blown away by the Spirit” in worship? What was that like? Does your church challenge people and make them uncomfortable? How do you strike a balance between comfort and discomfort, welcome and challenge?